I have have yet another trumpet for sale by a third party. 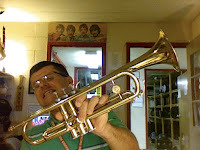 It is a Holton trumpet and in fine shape...ready to play. Asking price is $200. Please contact me if you are interested and I will put you in touch with the buyer.